You can have a ball taking online quizzes on Facebook and other sites, but here are some things you should know before you do. But I'm not crazy (at least, not completely). I've just been taking a lot of online quizzes lately--you know, the ones all over the Web promising to reveal your IQ, personality traits, or celebrity resemblances. Aside from discovering my inner Sleeping Beauty, I've also learned something important: These quizzes are about far more than providing users with enlightening or entertaining information. While Web quizzes may be fun to take, they're also a powerful tool for companies to collect your data and even your money--and often in ways you might not notice. We'll get to the spooky stuff in a moment, but let's start with the simplest method of quiz-based marketing: advertising. The very nature of a typical online quiz requires you to divulge all sorts of details about yourself. Those tidbits of info are like nuggets of gold for advertisers craving a way to connect with you. "The big trend is about engagement," says Debra Aho Williamson, a senior analyst with eMarketer. "These quizzes are getting people to pay attention to ads." Paying attention, it seems, is almost a requirement: Aside from being carefully targeted at your interests, the ads are often in-your-face and impossible to avoid. 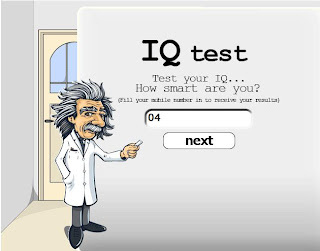 Take, for example, TheFreeIQTest.com, a quiz I found via a text ad on Google. By the time I clicked through the 105th "offer" (aka advertisement) it threw in front of my results--no exaggeration--I gave up without seeing the results of the quiz. "There's a clear annoyance factor, leading people to one thing, then at the last minute bait-and-switching them," Williamson says. "The challenge with this type of advertising is walking that line between people wanting it and people wanting it to go away." The ads can follow you long after you click away, too. Just look at RealAge, a detailed quiz that assigns you a "biological age" based on your family history and health habits. The site, a recent investigation revealed, takes your most sensitive answers--those about sexual difficulties, say, or signs of depression--and, if you opt in, can send you e-mail messages about those conditions. Those messages are, in some cases, sponsored by drug companies looking to market medications for those conditions. Unwanted advertising, unfortunately, is only the tip of the iceberg. Some online quizzes will surprise you with required payments or purchases before you can access your results. While the requirement may be in the fine print somewhere, it's often not in a place you'd easily notice before beginning the process. Then there are quizzes like CheckMyPersonality.com. Its Web site says, "Happy! (Shy) Sad? Outgoing, Fun? Which are you? 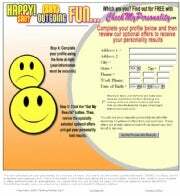 Find Out for Free with CheckMyPersonality.com." This site goes as far as to periodically access your credit card once you've signed up. I discovered a line in the company's privacy terms that gives it an ongoing right to "verify that your credit card account is valid and has credit available" by charging fees and later crediting them off. CheckMyPersonality.com also authorizes its owners to dig up all kinds of information on you. The company states that it may use "third-party service providers" to track down everything from your household income to your buying habits--and then resell that data to marketing agencies. "These [types of sites] are data-mining havens where users willingly opt-in from the very beginning," says Ryan Jacobson, an attorney and cochair of the Entertainment Media and Privacy Law Group at the law firm SmithAmundsen in Chicago. "I'm afraid that the average user fails to recognize or take the time to understand what privacy rights he or she is actually giving up by responding." CheckMyPersonality.com, incidentally, didn't respond to our requests for comment. Ultimately, deciding whether you should take an online quiz comes down to a question of trust: Are you comfortable putting your information--personal or financial--into the owner's hands? Remember, even if you don't directly input data, it can be passed along. Such is the case with Facebook, where just opening an application automatically grants its developer access to your entire profile. And don't assume that the developer isn't going to use the information within. "The very intimate and detailed nature of the information featured on Facebook profiles makes such a database very valuable to marketers," says Guillaume Lovet, a senior manager with security company Fortinet. Finally, bear in mind that the quizzes' results may not even mean much. In the case of online IQ tests, for instance, many of the exams are about as valid as my excuse for missing mah-jongg night at the clubhouse. "These things are simply not sophisticated," says Dr. Martin Eaton, a licensed clinical psychologist and adjunct professor at the University of Southern California. "Calling them intelligence tests would be a misnomer." The test that declared me a genius, I can only assume, was a rare exception.